Our short bus ride from Silverton to Durango after a grinding train ride in the opposite direction - about an year ago - gave us a sample of the jaw dropping scenery of the South West Colorado region. A little Google search informed us that the route forms a part of ~230 miles San Juan Skyway, one of the best scenic drives in the United States. The internet search also empowered us with the intelligence to attempt the drive during autumn, when the scenery is generally at its dramatic best. The first weekend in October 2005 is when we got to execute our plan. Our trip started off in Grand Junction with the nearby Colorado National Monument being our first destination. We completed the 23 scenic miles of the monument in little over three hours, spending most of the time at the view points around the Monument Valley region, easily the most spectacular portion of the park. 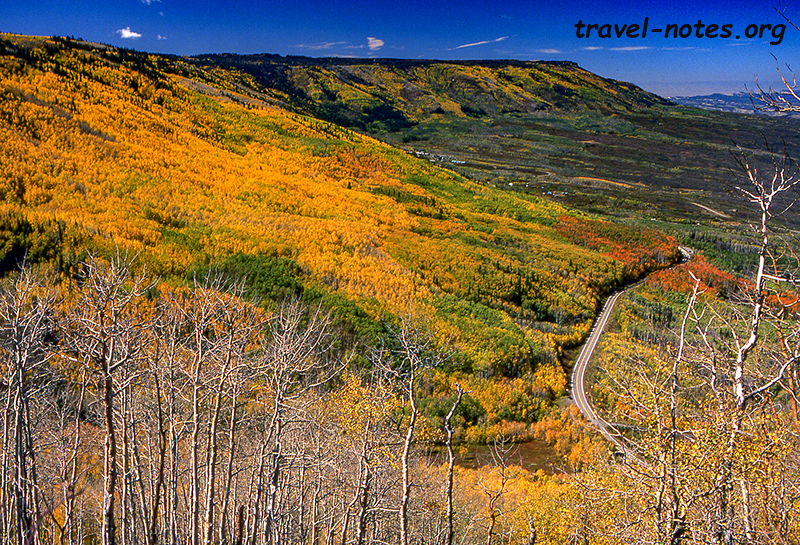 We got our first sample of the colourful Colorado on our next scenic drive - the 63 mile long Grand Mesa Scenic Byway. The Aspen trees were in their best outfit during this time of the year. They ported more shades of yellow than an average home improvement paint brochure. After three hours on the Grand Mesa, we somehow managed to drag ourselves out of the scenic drive so that we have enough time for the final one planned for the day - the 133 mile long Unaweep-Tebeguache drive. Although the drive traversed some beautiful mesa country, the lack of autumn hues made the drive look pedestrian in comparison to the others, so much so that the best part of the drive was infact the location where it ended - the San Juan Skyway - we had to drive along the San Juan Skyway for a few miles before we got to Montrose, our final destination for the day. The sunset views of the San Juan mountains from this final stretch was easily the most spectacular on our entire trip. We saw enough to make us wait with bated breath for the Lizard Head Pass, following morning. The following day, we got up early to complete the full San Juan circuit. We covered the 236 miles in little over 7 hrs. We were able to complete this in a day largely due to the 'been there done that' factor that made us skip most of Silverton, Durango and Mesa Verde National Park. The skyway crosses half a dozen passes - three of which being 10,000ft+ - each rivalling the other in the spectacular mountainscape that greeted us at the top. The scenery would have been worthwhile in any fair-weather season, but autumn really took it to a higher level. The must-sees of the drive includes the views from the Molas Pass, Red Mountain Pass, Telluride's bridal veil falls and of course, the brilliant sunset views around the Dallas Divide. 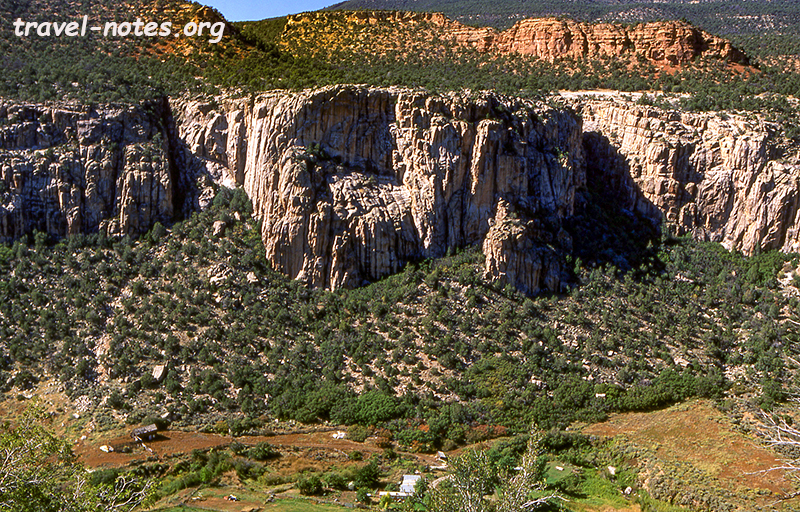 Our final day was reserved for the nearby Black Canyon of the Gunnison National Park. We made the mistake of going early to the park. Almost every view point on the south rim, the most accessible side, face east forcing you to peer right into the harsh morning rays. The best view point, ironically, turned out to be the sunset view, which as the name suggests, looked westwards. After spending a couple of hours squinting against the sun rays, we decided to leave the park and try to squeeze in one more scenic drive - this one to Aspen, the town. 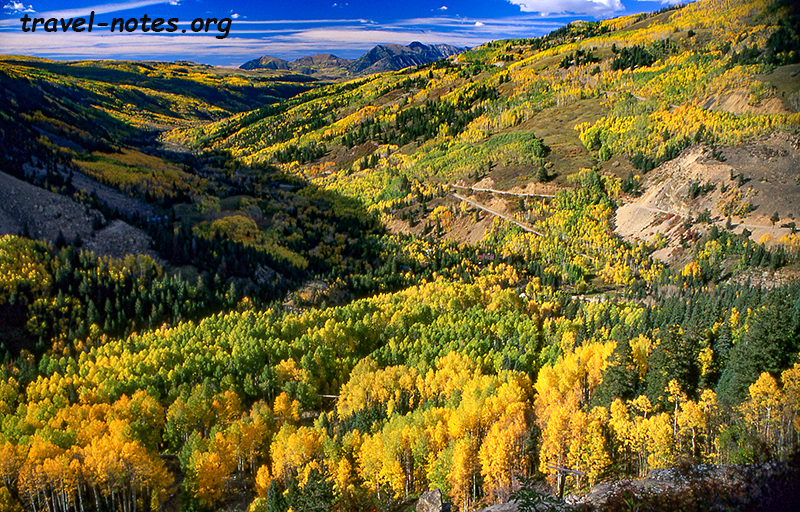 Quite contrary to its name, the town did not have as many Aspens as the earlier scenic drives. 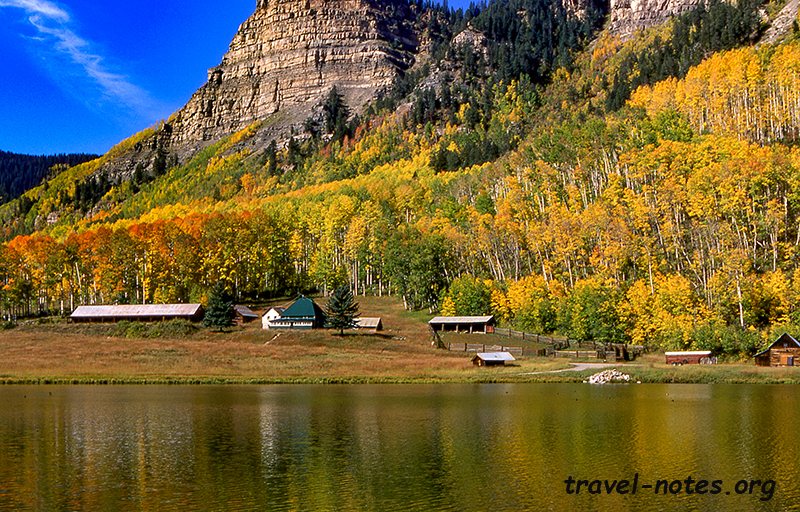 But in its defense, we did not have enough time on our hands to cover the most talked about part of the town - the Maroon Bells region. That in the end turned out to be the only disappointment on the trip. If we had timed the last day better, we could have visited the "bells" as well before scrambling back to where it all began - the Grand Junction airport! 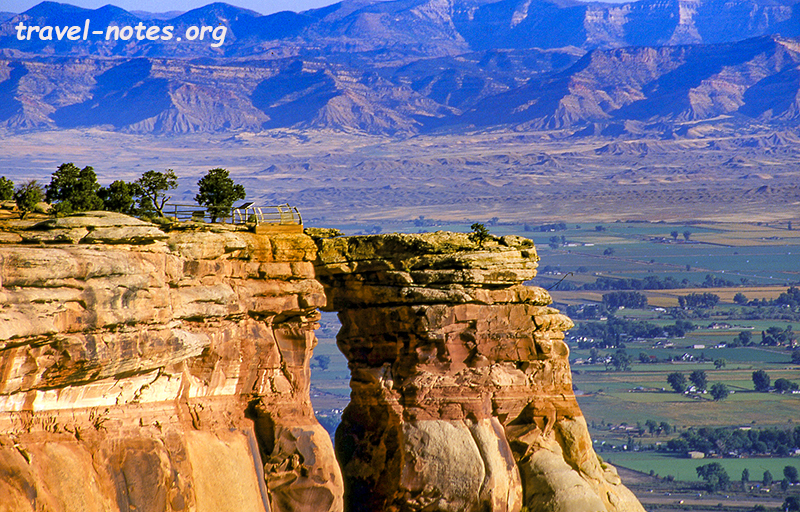 Click here for more photos from Colorado scenic drives. Click here for more photos from Colorado National Monument.